This year we bought our tree close to home. We went to a parking lot where they had set up a tree lot. We bought a tree there before and it was fine. So we thought we would try it again. I walked around and was trying to decide between three trees. Looked and looked – got it down to two trees. Looked some more and made a decision. Well, the funny thing about our tree that seemed like it needed a little grooming – it needed a lot of grooming. I think it might have just been cut open before we got there because A LOT of the branches were still “up”. I mean it is normal for branches to “fall”, but this one was a doozy. It has branches that stick out about a foot from the other ones. It is funny. But we like it. Here is our 2018 Christmas Tree for my Friday Photo today. Oh my! It is Christmastime already! How did that happen so fast? Whew! Well, I was nowhere near ready for it and so I have been absorbed in decorating and getting ready for all of the beauty of it for the last couple of days (weeks?) and I have ignored so many things and people (sorry) and I am still not feeling ready and/or organized. But here is one sweet thing for my Friday Photo. Ahhhh. A few days before Christmas. I hope you all are able to enjoy at least a few moments. Here is my Friday Photo, just a close up shot of our some of the decorations on our Christmas tree. I know, I have done ornaments for the last two weeks, but I really love Christmas and all the decorations and my ornaments! 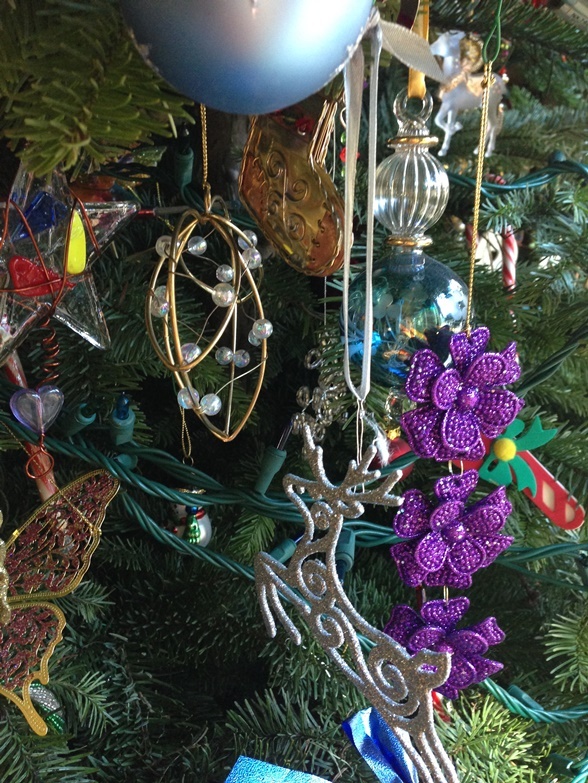 Hardly anyone sees all our great ornaments so I am taking advantage of my blog and posting Christmas Tree ornaments! This will be the last one, at least that is the plan. Who knows, I might take a picture I love as I am “undecorating” and want to post it. I will try to refrain. But this is a NEW ornament. I received it as a gift and it is just so cute. She is BIG, but light, so it will be easy to find a spot for her on the tree every year. YAY! Love my new addition. So this is my last Friday Photo of 2016. I will be keeping this “feature” in 2017. This is also my LAST post of 2016. Thank you for reading and liking. Thank you even more for commenting. I love interacting with readers. I wish all of you a happy and fun New Year’s Eve. And I wish all of you a GREAT 2017! So I always thought the Twelve Days of Christmas were the days LEADING up to the 25th. It was about 2009 when I was talking with one of my Nia students about Christmas and taking down the tree and decorations that she mentioned it. She is quite savvy when it comes to etiquette, traditions, and customs so she said something about waiting until the Epiphany. And I didn’t know what she was talking about. She said she didn’t take her tree down until January 6th. I did like the sound of that because it was a date in January. Usually we take our tree down the weekend after New Year’s Day. I need help as there is so much packing to do. That is the worst part to me. I hate putting everything in its own box. But I will not just put all of my ornaments into those ornament holder boxes . . . . OH NO WAY! So, yes, I cause my own misery. Thankfully I have a husband who helps. I take stuff down and hand it to him with the box and he puts it in. He gets to sit and “relax” and watch a movie and I get my ornaments put in their original boxes. Yay. This year on the day we typically would have taken down the tree, I just didn’t want to. I wasn’t ready. We were gone for – what I think of as – a long time so I felt as if I “missed” some days of Christmas decorations. Plus I knew it would take longer than one day and I had a Nia Class at the YMCA on Sunday so I knew we wouldn’t get it all done. We decided that I would start this week and we would finish this weekend. This is when I said that we could abide by the “whatchmacallit?”, ya know the days after Christmas? The . . . I couldn’t remember so I had to look it up. The day my Nia student had referred to was the Epiphany. But when I looked it up there were some other days I don’t ever remember hearing about. Could be that I didn’t know about these dates because they look as if they are related to the catholic faith. At least the website that I found is. My family was once catholic, but we stopped going to a catholic church before I had to go through all of my catechism classes and take my first communion. “What are the other feast days and holy days during the Christmas season? The Feast of the Holy Family, honoring Jesus, Mary and Joseph as a family. It is celebrated on the Sunday after Christmas or on December 30. When Christmas falls on Sunday, it is celebrated December 31. The Epiphany, the oldest of the Christmas feasts, is also known as Three Kings Day for the three magi who found the Christ Child after following a star to Bethlehem. It is celebrated on Jan. 6 and is the major holiday of the Christmas period in the Eastern Church. So basically what this timeline is telling me is that the Christmas season comes to a close on January 11 this year. Which is pretty perfect because that is when I hope to have all of our Christmas decorations taken down and stored away. I really thought the Twelve Days of Christmas were the days LEADING up to the 25th. So that is why I am not familiar with the Epiphany. If I knew the Twelve Days STARTED on Christmas, then I would have “got” the whole Epiphany thing. Am I the only one? Did you know what the Twelve Days of Christmas were? More Sparkle, More Shine, More Fun! I understand that Christmastime/the Holidays are a sad time for some people. For those people I send light and say prayers, but for those of you who love to let the joy of the Holidays in, I have some things I want to share. It occurred to me as I was doing some things that what I was doing made my Holidays super fun. It made me think that, perhaps all that silly stuff is part of why I love the Holidays so much. You want more fun? You wanna squeeze even more joy out of or into your Holidays. Maybe some of these things will add more to your Holidays, maybe you will think they are a waste of time or they won’t work for you, fine. But they make me happy. So here is MY list of things I do to give my Holidays more sparkle. >>>>>>>Cleaning before decorating is awesome. A few years in a row I was trying to clean at the same time I was decorating and that just really bugged me. With the house all clean beforehand I can run from room to room putting up the decorations wherever I want. I don’t have to clean one table or shelf and decorate as I go. I know this sounds weird to some people, but putting my sparkly decorations on a dusty shelf next to some dingy dusty shelf item just doesn’t work for me. So this is one thing that does a lot of things for me. I am listing them in no particular order. –Shopping all year round helps spread the cost of Christmas out over the year. The Holidays can be expensive so if I can spread out the bill that helps. –When I see something and it makes me think of someone who I shop for then I might as well get it so I don’t have the stress of trying to find something for them when it is Christmastime. 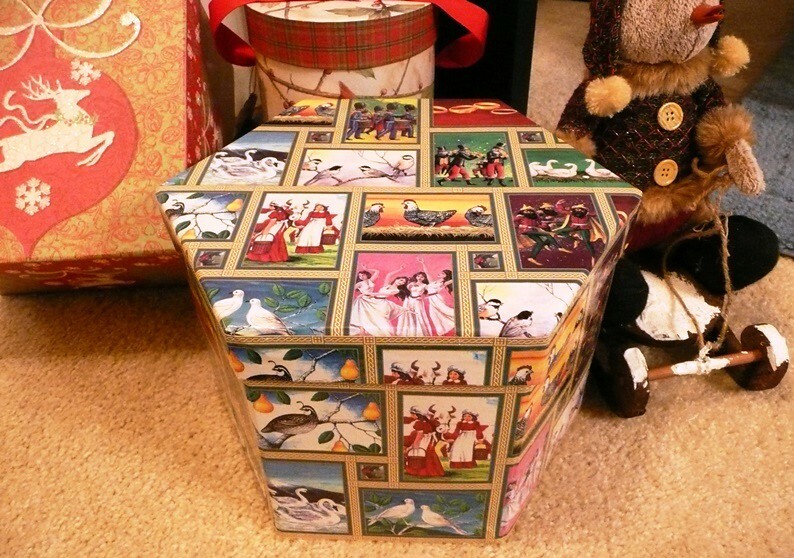 –It is really fun looking at the stuff at Christmastime (when you go to wrap it) that you bought earlier in the year. If you are like me, you don’t remember all that bought, so it is so fun discovering it again. >>>>>>>IF you shop all year round keep a gift log (in one spot) of what you bought for who AND where you stashed it. I don’t know if you have ever bought a gift for someone then forgot about it or just forgot where you put it only to discover it later. Well, I keep a list of who, what, and where! That way if I see something I want to buy someone I bought for I can refer to the list instead of opening bags. Having a list also helps keep me from “over-buying” for someone. So there are a few reasons to keep a list. >>>>>>>Consider decorations and ornaments gifts. Enjoy the walk down memory lane. To me opening my ornaments and all my decorations is like getting hundreds of gifts every year. I love decorating and I love all my sparkly and glittery ornaments so unwrapping them or pulling them out of the boxes is super fun. My mom gave me a lot of my ornaments! >>>>>>>Saving beautiful cards. 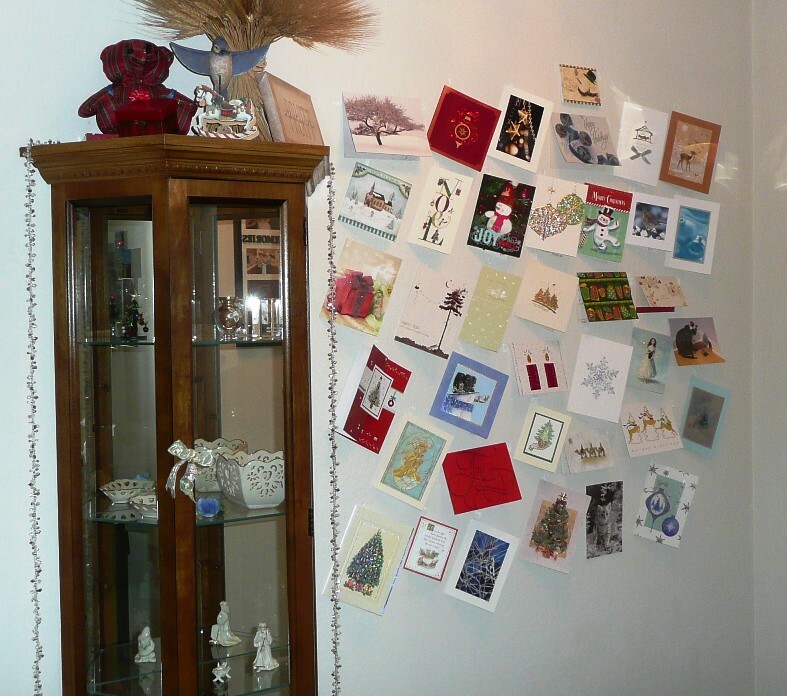 I’ve posted before about saving Christmas cards we receive and using them as decorations. Well, this year, I was in a rush and I wasn’t going to hang up the previous years’ cards. But I decided it would just take a minute or two. So as I was putting them up I was glancing inside at who they were from and that just made me happy. >>>>>>>I let go of my desire for a perfect tree. Not sure if I have mentioned this in a previous post, but I used to insist on buying one that was perfect. Ya know, like on a Christmas card. Well, as you know, those don’t exist and we don’t need a perfect one anyway. We do better with one that is kinda flat on one side and then slopes nicely on the other side. The flat side goes toward the window and allows us to have enough room to walk by the tree. If it is “perfectly” shaped it has to stick out into the walkway and just doesn’t work. Plus by the time we get home and decorate whatever tree we buy it is “perfect”. Yup, just like Charlie Brown’s Christmas tree! Ok, again, I know that the Holidays are a struggle for some people. I hope those of you that struggle make it through. I know that you will not be helped by a clean shelf or unwrapping a beloved ornament. You are in my thoughts and prayers, these ideas are for people who enjoy the holidays. And perhaps want to eek out more. Perhaps cause less stress and create a little more sparkle and shine. What do YOU do to get more joy out or your Holidays? You might know I love decorating for Christmas. You might also know my cat is sick. She has a chronic disease. My husband and I work to keep her symptoms under control and make sure she is a happy cat. One thing about cats though, they don’t seem to mind vomiting as much as WE mind them doing it. They just hurl and move on. I was not looking forward to having to spend the additional time needed to clean with the Christmas Decorations added onto her frequent regurgitation. But so far so good. Every year though, her and I fight over “underneath the tree”. She thinks it is her spot. I think presents belong there. 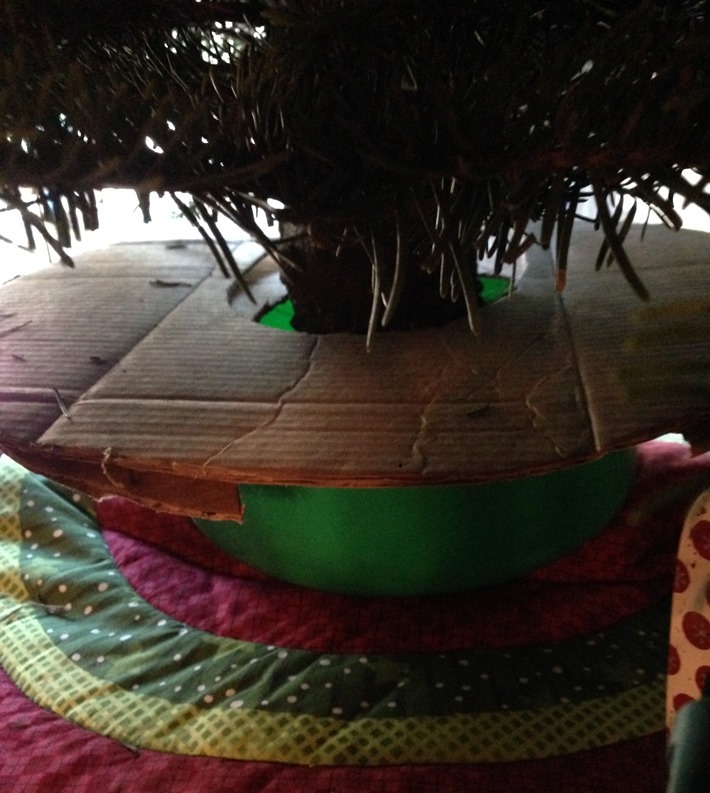 Last year the second the tree went up she cemented herself IN THE MIDDLE of the underneath and rarely moved! This year I made some kitty concessions to allow for a happier kitty. Cats with Inflammatory Bowel Disease can live up to five years after diagnosis, but you never know, so this year she gets special treatment. For almost all of the 13 Christmases that we have had her we have put our tree up on a table. Some think it is odd to put a 6 foot tree on a table, but it saves a lot of time and headache. 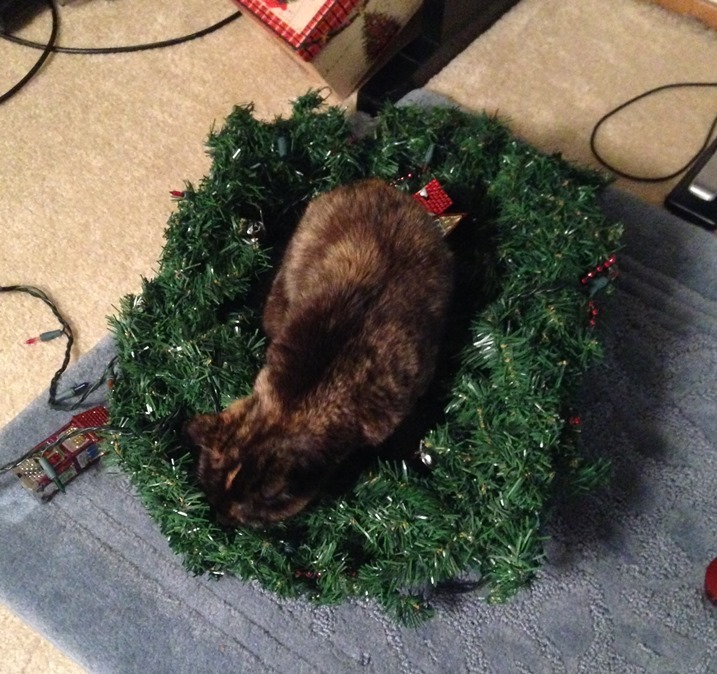 Our cat has never been one to climb the tree or even futz with the ornaments, but she does love “underneath” the tree. And all real/live trees shed so when she would walk underneath it she would brush it with her tail and cause needles to fall all over. While I love a real/live, I don’t care for the needles all over the place. They are not called needles for nothing. They hurt when they stab your foot. So, we started putting the tree up to keep from having needles all over. That also allows for more room for presents . . . at least so I thought. Some years I have left room for her, but this year I hadn’t put any gifts under the tree, I was going to let her have the entire space, but after a few days of her having it all to herself she hasn’t been under there since. 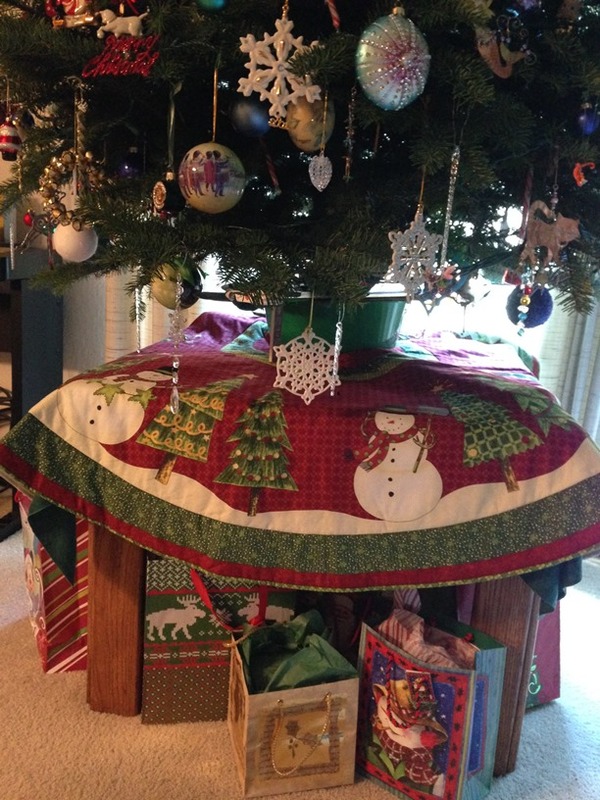 So I did put a few gifts under the tree, but still have a bed for her there. W here she has chosen to lie is in my reindeer spot. As I was decorating I was struggling with how I was going to get her to agree to a move. We do not know why she has chosen this odd place near the curio, but it has been her spot for a few months now so I was not looking forward to the battle. Then I realized, I probably wouldn’t really “win” no matter what, so I moved my reindeer spot. They are now under the tree. 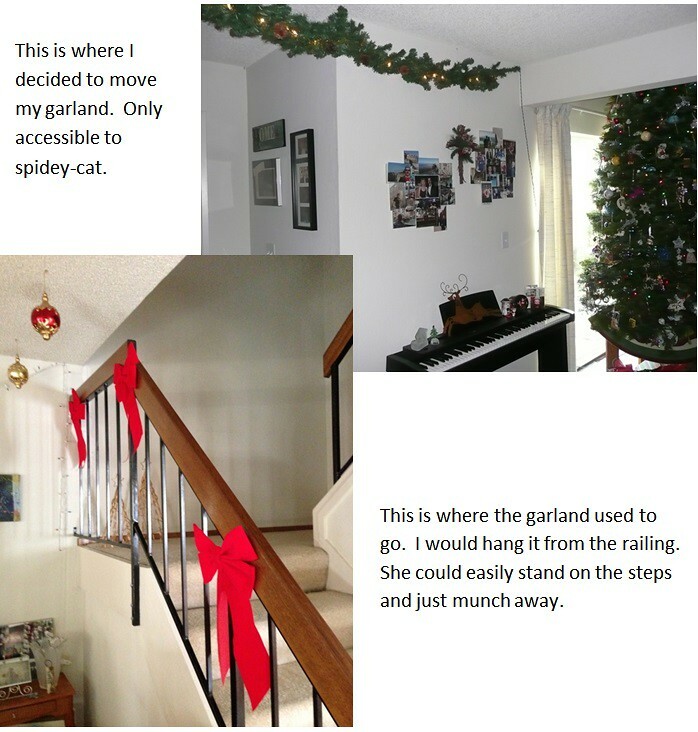 Also the last couple of years she has been chewing on the garland. Last year I finally was so tired of scolding her I took it down. This year, I decided not to put it up on the banister. That room needs light though, so, I moved it to an impossible-for-a-cat-to-reach spot. Yay! Now I have my garland and lights up, AND no chewing. 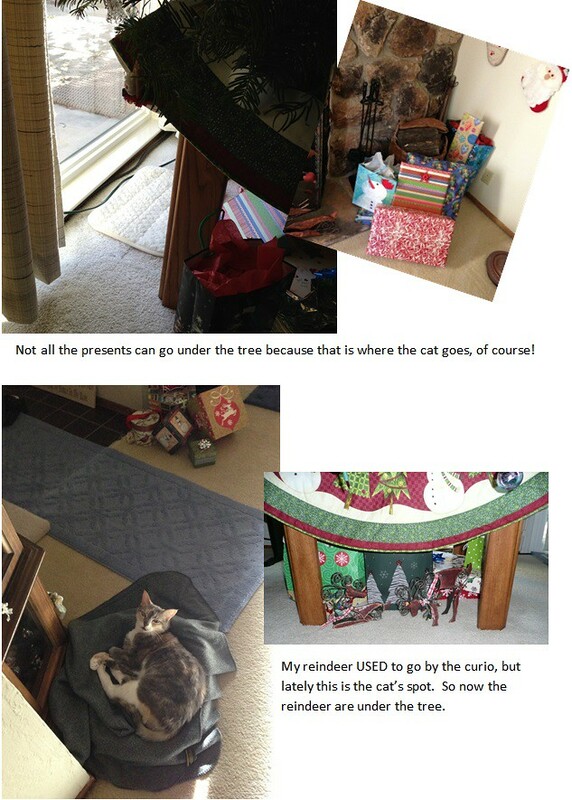 Cat and decorations are safe! Now, I mentioned this on Facebook earlier this month. In the past we have had exactly 30 days for the tree. At 31 days, the cat DOES swat an ornament. I took that to mean that she was done with the tree, it was time for it to go outside. This year since she doesn’t use her displaced tower as much now as she did then, she might let it stay longer, but really, in our house it doesn’t need to be up longer. And I am happy for the time she allows us to have it undisturbed. Ahhh. I love Christmas decorations. I think this year we have some good compromises going on. Do you have to decorate in concession with your pets? What do you do in order to keep your pet happy? It is Christmas, and while I did not have to “work” — as in teach a Nia class, I still have to “work” — as in post a blog post. Had I been a little more organized I would have had it written and had it post on a timer, but I was not that prepared. I had been thinking about what to write when last Monday after Nia one of my students was talking about one of her family’s traditions. I had asked her to give me more info or to write about it. But as I had been interrupting her story, I stopped my line of questioning/instruction and she finished her story and then I never got back to asking her more information. Then on Wednesday I forgot. I was thinking I would see her on Christmas Eve, but I did not. So I am going to share her tradition without a lot details as to how it works for her family because I don’t know them. I think the idea is so cute I wanted to share. THEN, I got one of the greatest Christmas gifts ever last night and I wanted to share a bit of it too. So Merry Christmas. This is me sharing a tradition of one of my students that maybe you would like to do yourself and a beautiful gift I received. First the cool tradition. I haven’t heard a lot of the details but it sounds as if my student’s kids are going to moving out soon. 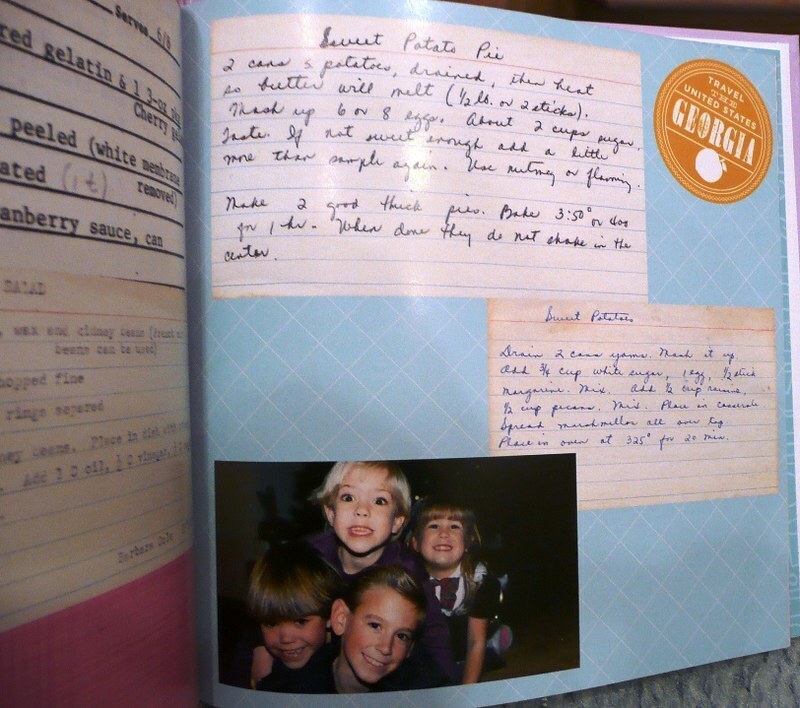 I believe that is one of the reasons she shared with us the tradition she started when they were young. She has had her kids gift each other a Christmas ornament every year. She was saying, when I came into the conversation, that this way they will have a start on having ornaments for their tree when they move out AND they will sentimental value. Each ornament will be a memory. She had said that one year her son crafted a little birdcage and put a picture of a bird in it to represent their family pet. I thought that was so cute. Not only did her son have an ornament for his sister, but he had made it. 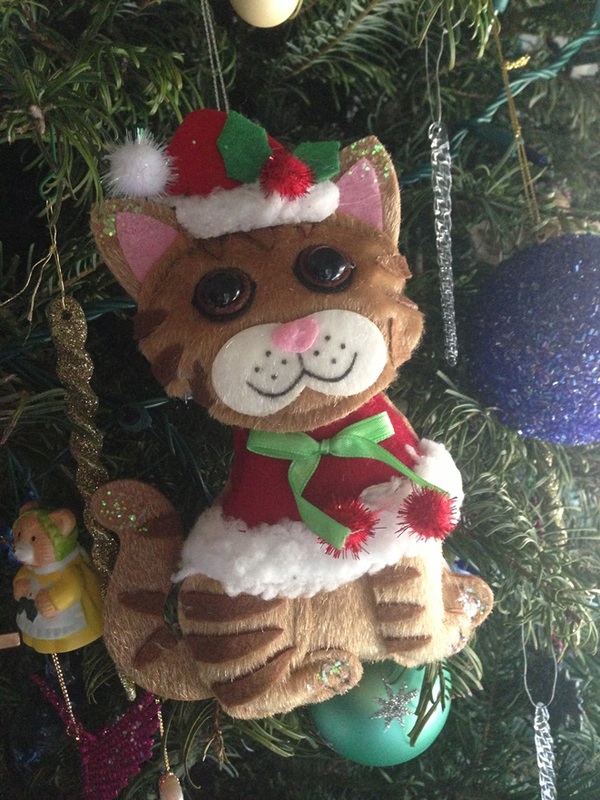 You may know from reading some of my previous posts that I LOVE Christmas Ornaments. I love the entire process of unwrapping each one to hang on the tree. It is as if I am receiving little mini Christmas gifts with each ornament I unwrap and place on the tree. And many have memories attached, so to me decorating the tree is a lovely process and tradition. So I really, really, really, really, really LOVED this idea. As I mentioned, I loved it so much I wanted to share it. 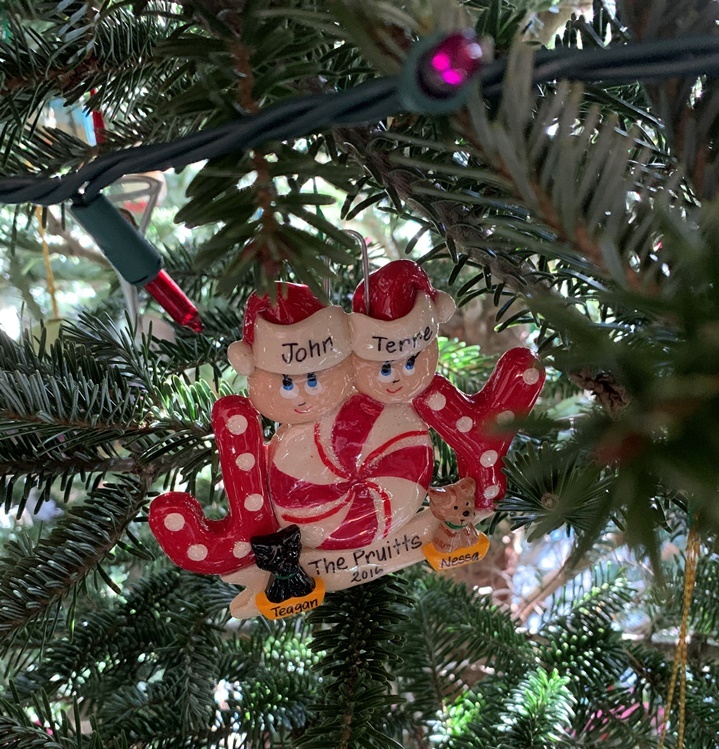 I think it is great to have kids receive “their own” ornaments that they can take with them when they move out and that will have meaning for them. Now one of the greatest gifts I received was a book. Apparently my nephew-in-law has a brilliant girlfriend. 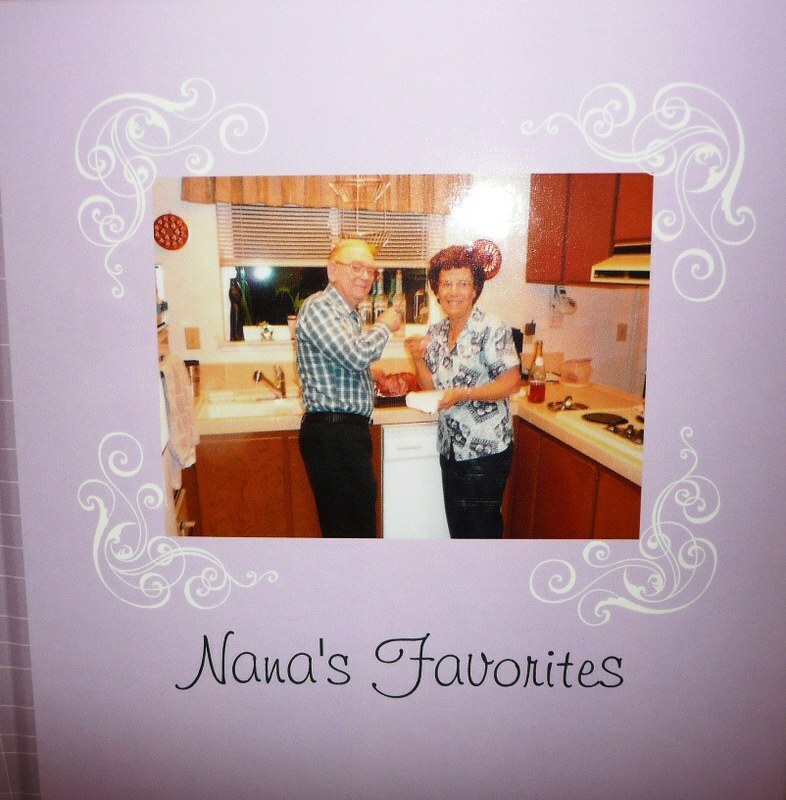 She had a book made for his sisters that contains their grandma’s favorite recipes and a party tip. 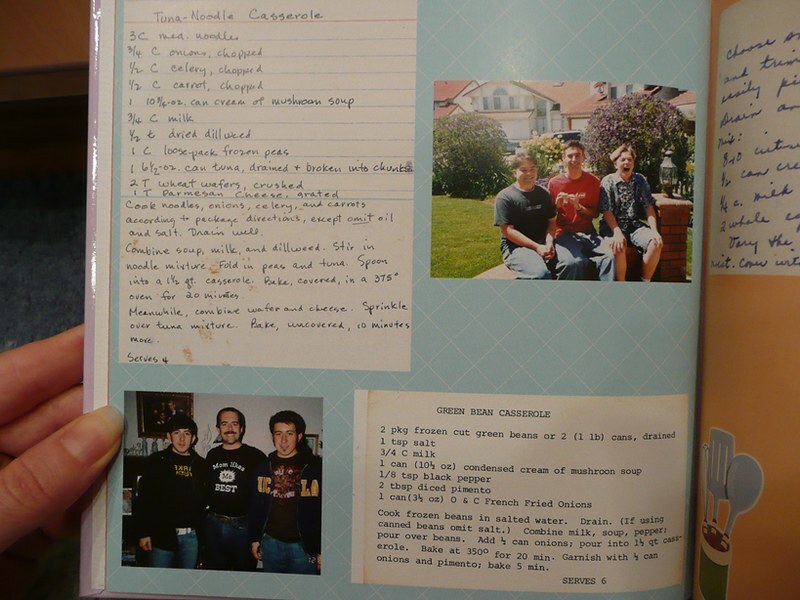 His girlfriend designed it to have the actual copy of the recipe placed on the page along with family pictures. You might have read some post on my blog that shared the fact that their grandmother (my mother-in-law) died last year in November. 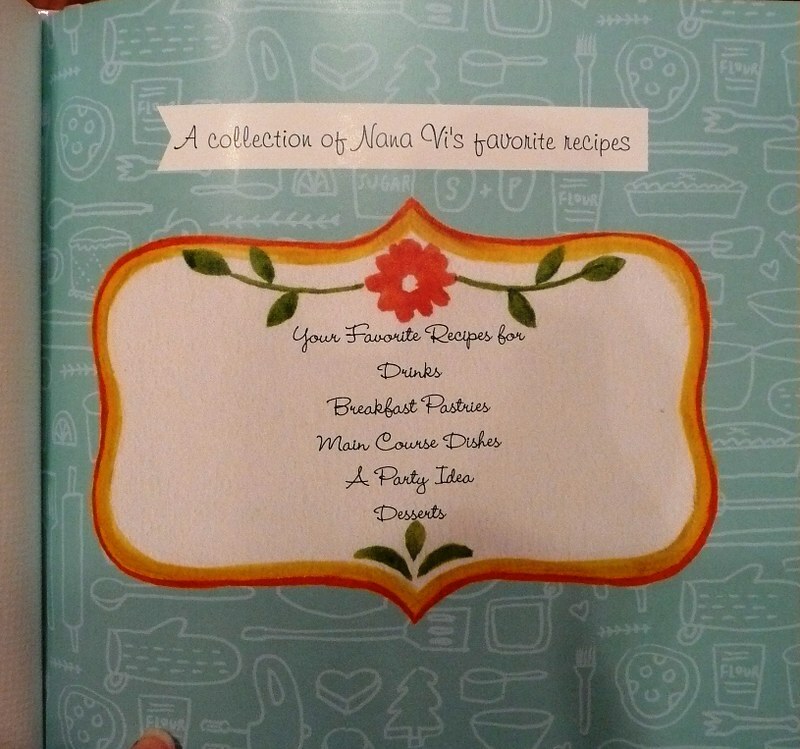 My sister-in-law (John’s sister) is a smart cookie too and she knows a great idea when she sees it and she asked if she could use the book template for gifts also. 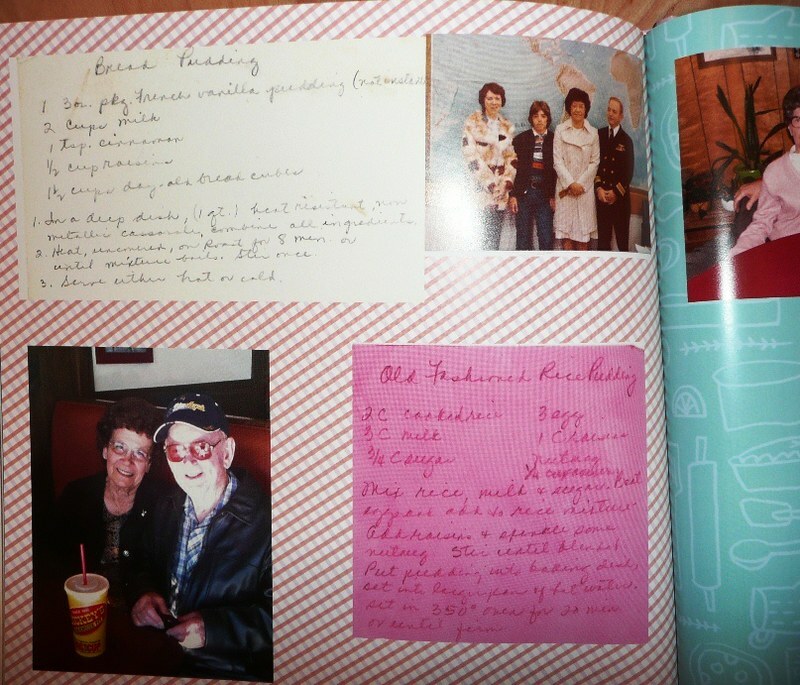 So SHE swapped out some of the pictures to include more of the recipient’s family. So the ones made for the girls have more pictures pertaining to them. The one made for my husband and I has more pictures pertaining to us and so on. FANTABULOUS! It is awesome! I am in awe of BOTH of these things . . . . the ornament tradition AND this wonderful recipe book. I hope you had a Merry Christmas and the rest of this season is grand for you. Do you have any holiday traditions to share? Maybe you have had a custom for a long time? Maybe you just started one? Did you get a gift that you are excited about that you want to share? Tell us! I first want to say that Nia in San Jose is on it’s regular schedule even with the surrounding Holidays. 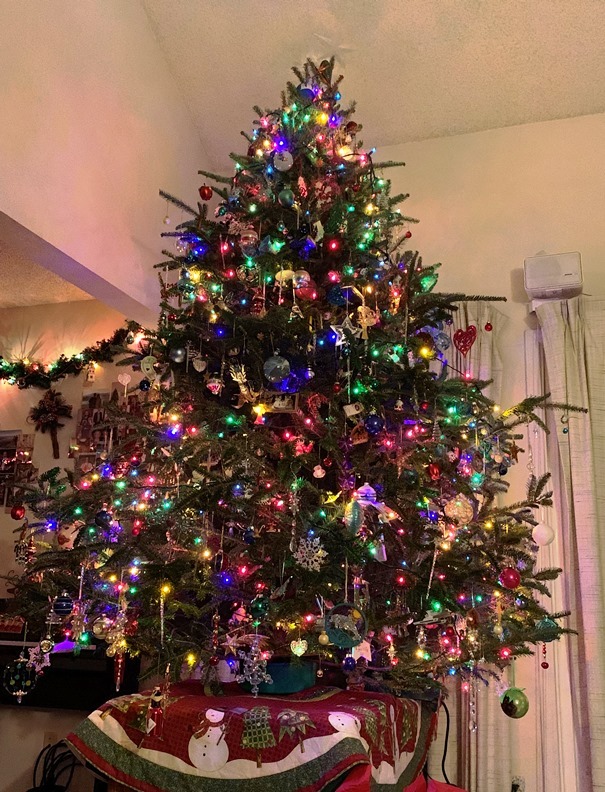 Next, I want to say with so much holiday stuff around me it is more fun to post about decorations, cards sent, cards received, gifts given and received, Christmas Trees, ornaments, lights, and the cheer, than about how to exercise “off” those extra calories you might be consuming. It is better to avoid eating too much than to try to work it off. Many websites give you advice on how to avoid over indulging at parties, I posted one myself last year. They are articles of advice on how to keep motivated during the holidays everywhere you turn. As you know I like to post about other things. I love Christmas and all of its decorations and cheer that it brings. I love how people get creative with gifts and decorations. When I first saw this I wanted to post about it. But I often hesitate because I do also want to post about exercises and working out, but this kept popping into my head. I love it that much. I have a friend I know through blogging. I believe I “met” him on another friend’s blog. I forget exactly how the timeline went but we started following eachother on Twitter and we are friends on Facebook. He is one of those people that seems to be everywhere. I don’t know how he does it, but he comments or “likes” my posts and my photos on several sites. He is one of those people that is very supportive. He is always there to support me in my internet dabblings. He takes great pictures. I am always amazed at the shots he gets on his morning walks. But the latest photo that had me clapping with glee and I just can’t get out of my head is the photo of his book tree. I keep thinking, “Who would think of that?” Well, the answer is a man that works in a bookstore, but still, I love it. It is so cute and so imaginative. Really why can’t you decorate anything, right. I also kind of think of it as a bit of a joint effort. He, of course, came up with the biggest part, putting it together and stringing it with garland. I just make a tiny suggestion of using paper clips (or a strong wire) to hang the ornaments. This is one of those things that just makes me happy. Do you have simple things in your life that make you happy and make you smile? This is one of them. Simon is often making me laugh and smile, but I really loved this one and wanted to share. I received permission to post his picture here. You can see it here (click) on one of his blogs. A note to Simon: Simon, my friend, you are a constant source of smiles and laughter to me. I appreciate how you are always so supportive with your “likes” and comments. I think you are a great photographer and look forward to the pictures of your morning walks and all your pictures. Thank you for this lovely book tree, it makes me giggle when I think about it. I hope you all enjoyed his little book tree. I hope that no matter what holiday you celebrate at this time of year you are having a happy and peaceful time. Thanks for being here!